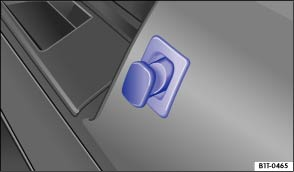 A retractable bag hook can be found on the upper right-hand side of the luggage compartment. Light shopping bags can be secured here. Pull the bag hook down . Never use the bag hooks as fastening rings for straps. The bag hook could break off during a sudden braking manoeuvre or accident. Do not load the bag hook with more than 2.5 kg.